This new Patent Pending Self-Propelled Hi-Brd 4 GPU is ideal for operations that do not always have access to a tug but need to have the ability to easily walk the unit to the aircraft out on the ramp. 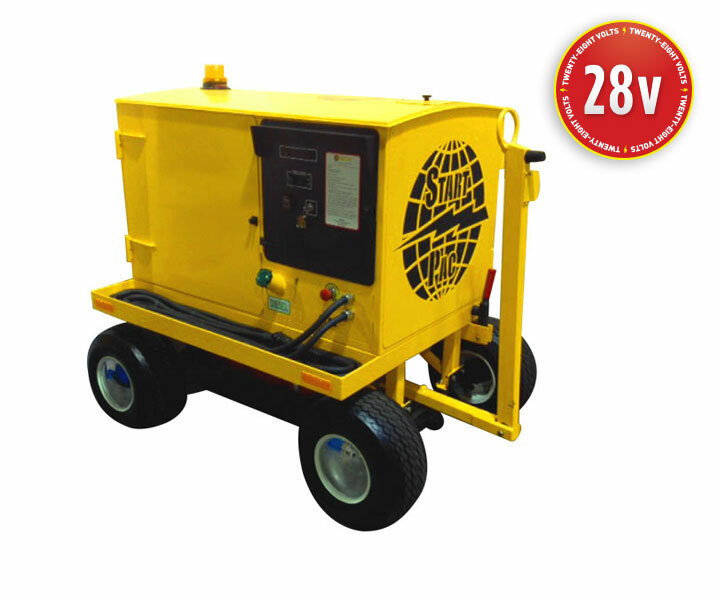 The unique self-propelled feature makes this eco-friendly 28 volt ground power unit simple and easy to maneuver on the ramp for shorter distances and yet can be towable for longer distances. The 28 volt Start Pac Hi-Brd 4 GPU is one of a select few GPU units that meets current Tier IV EPA emissions standards. This compact economical 28 volt hybrid ground power unit consumes up to 75% less fuel than traditional equipment and runs much more quietly and efficiently. The simple easy to use key ignition allows for fast on the job training and operation. The unit comes standard with our patent pending 26 volt lithium ion battery technology that read 28 volts when fully charged with a lead acid option if preferred.